-2- the past year. Those who are critical say that: -riots and violence have produced new waves of white resistance to further progress; -and political candidates running on a platform of 'Never!' have defeated men of moderate, progressive views. To these persons I can only say what is in my heart: -The morality of the struggle for freedom and human dignity is just as clear today as it was one or two years ago. And ultimate victory is just as sure. Victory is sure for many reasons. Never before in history has a nation consciously acknowledged the reality of racial discrimination and set about to combat it. But America has made that commitment. From all parts os our society an alliance has been forged, with common commitment to the dignity and equality of all men. The handful of courageous persons who were marching to freedom ten years ago in Montgomery and Little Rock has swelled to a mighty tide of humanity. And this tide will not be turned back. Of course, the wrongs and evils of generations cannot be corrected easily or without sacrifice - just as a mighty storm cannot pass without creating turbulence and unrest. But after the storm comes the brilliant sunshine of a new day - and with the sunshine comes renewed faith a nd strength. American has been passing through a difficult period of turbulence. But if we hold true to our course, if we navigate with skill and courage, we shall break through into a bright new day of justice and opportunity. This new day is coming." -Excerpt from Vice President Humphrey's commencement Address at Howard University - 1966. Despite the 'so-called' "white-backlash"..., the disunity among the various civil rights organizations and the great harm which ha s been done to the cause by the riots of the past year,...according the news analysts, the struggle for equality is not at an end nor will the reports of dissension among the rights groups hold back the tide of progress in their attainment of the ultimate goal of freedom for all. 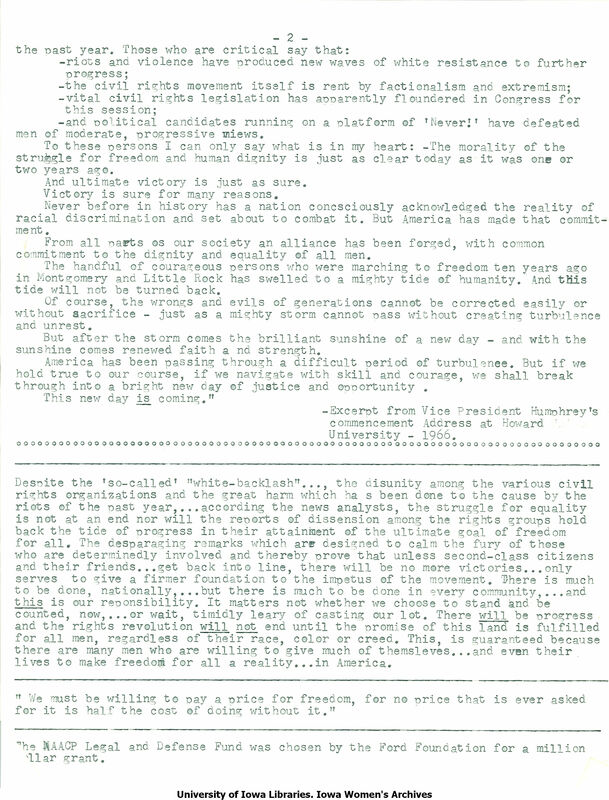 The desparaging remarks which are designed to calm the fury of those who are determinedly involved and and thereby prove that unless second-class citizens and their friends...get back into line, there will be be no more victories...only serves to give a firmer foundation to the impetus of the movement. There is much to be done, nationally,... but there is much to be done in every community,...and this is our responsibility. It matters not whether we choose to stand and be counted, now,...or wait, timidly leary of casting our lot. There will be progress and the rights revolution will not end until the promise of this land is fulfilled for all men, regardless of their race, color or creed. This, is guaranteed because there are many men who are willing to give much of themselves...and even their lives to make freedom for all a reality...in America. "We must be willing to pay a price for freedom, for no price that is ever asked for it is half the cost of doing without." The NAACP Legal and Defense Fund was chosen by the Ford Foundation for a million dollar grant.